MSc Building & Urban Design in Development student and REVOLVE co-founder wins a UCL Engineering Engagement Award as the result of the ‘Rebel Space’ project delivered in Brixton. Congratulations to MSc Building & Urban Design in Development student, Akil Scafe-Smith, who last week received the UCL Engineering Engagement Award! Akil, along with Gameli Ladzekpo, is the co-founder of RESOLVE, an interdisciplinary design collective that aims to solve multi-scalar social challenges using innovative design and interdisciplinary methods. 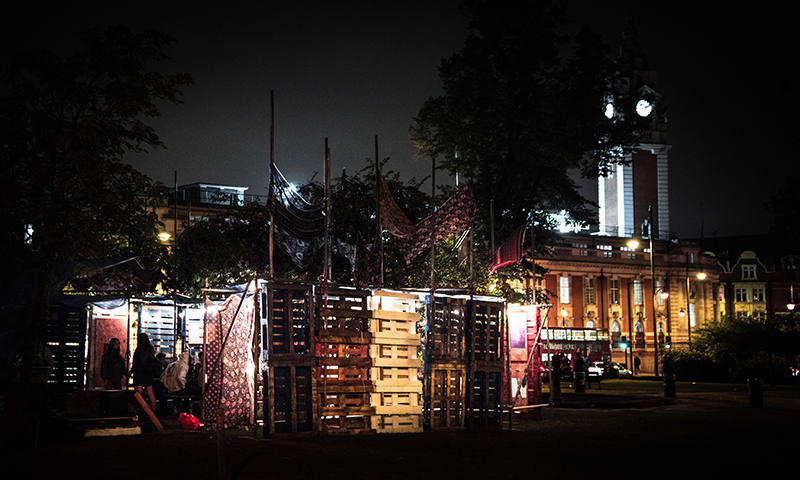 The award was a recognition of the continued engagement work as a result of the ‘Rebel Space’ project RESOLVE delivered for the London Design Festival last summer in Brixton, South London. The project took on two phases, the first being a workshop for young people from underrepresented backgrounds that introduced them to interdisciplinary concepts in design, engineering and architecture, whilst working collaboratively with them to design aspects of a temporary pavilion we erected in St Matthew’s Church Garden. The second phase was a weeklong series of exhibitions and events in this pavilion that showcased the work of artists, activists, academics and professionals on various social issues whilst providing a platform for people to talk, share, affect and engage with these issues. The project was kindly funded and supported by UCL Grand Challenges, UCL Engineering Outreach and UCL UrbanLab, alongside a host of incredible local businesses - Lee Scaffolding, Nanban Brixton, Sackville Travel, to name a few - without whom the project would not have come to fruition. For REVOLVE, winning the award was especially gratifying, although today the word ‘engagement’ entails a variety of meanings and is often diluted by the funding-oriented demands that tend to consume both academic and professional discourses. Its value rests in the continued belief that the success of this project relied not on an adherence to ‘engagement’ as a metric but rather to ‘engagement’, the candid act. The project was essentially reliant on the participation, collaboration and engagement of an inexhaustible series of groups and individuals, ranging from the wonderful schoolchildren at ELUTEC to the incredible local and international artists we exhibited to UCL/LSE academics to the misunderstood frequenters of St Matthew’s Church Gardens. It was this range of groups and individuals that shaped everything from the design of the pavilion to the order of the week’s timetable and in doing so were shaped and (hopefully!) influenced by the project itself. Engagement wasn’t merely the presentation of work from academia to ‘the local community of Brixton’. It was instead the bridging of a multitude of groups and communities, providing a platform for the production of new knowledge and ideas. Whether or not this was achieved, the concept of platforms like this, in a part of the city that is witnessing irreconcilable changes, are of growing importance. They are crucial interstices in an ever-growing landscape of siloed identity. Intervening spaces where we, a ‘public’ that is intersected and proliferated by so many disparate and at times paradoxical identities, can engage with one another over issues that matter, and argue, stumble and persist towards meaningful change.